The Board Members of the United Neighborhoods Neighborhood Council wish you a joyous Holiday Season. 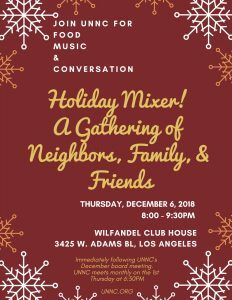 Join us for our Holiday Soiree after our December Board Meeting at the Wifandel Club House located at 3425 W. Adams Blvd!! Happy Holidays! !